Many congratulations to Ms Kim Ri Hwa for her FAO model farmer award which was presented to her last month in Bangkok. Her efforts have seen a tenfold increase in rice production on the Maejon Cooperative Farm where she has helped the 80 farming families turn their lives around. That is a significant success! Kim achieved her results by adopting Conservation Agriculture (CA), which helped restore the quality of the soil on the coastal farm she now manages in partnership with the AFSC (American Friends Service Committee). Her success is particularly well timed as sea levels are impacting dramatically upon her region and across the southeast Asian region as a whole, causing high soil salinity and devastating crop losses. Once the integrity of the soil on Maejon Farm was re-established, the introduction of the System of Rice Intensification (SRI) helped, over a period of seven years, to increase rice yields from a paltry 1 tonne per hectare to an impressive 10 tonnes per hectare. This is an achievement not just for Ms Kim but also for SRI itself as it comes in the context of an average yield in North Korea of 5.3 tonnes/ha. Even commercial farmers in the country, using all the best management practices, latest seeds and chemical inputs do not often attain such results. The introduction of other innovations at the farm has also brought about an 80% increase in maize production as well as a 70% decrease in root diseases. CA was introduced to North Korea over 15 years ago by the Food and Agriculture Organisation of the United Nations (FAO) and the AFSC has been encouraging the adoption of SRI in the country since 2004. “It saves equipment, it saves fertilizer, and it also saves them labour in lots of ways. So, it really is a successful innovation,” explains AFSC’s country manager for North Korea, Linda Lewis, who believes SRI now has the potential to spread nationwide. Kim Ri Hwa grew up in the city but embraced the world of agriculture after responding to a call for people to help develop the countryside. Hard work rewarded her with the position of team leader on a cooperative farm and she qualified as a crop engineer before managing the Maejon Cooperative Farm. Other recipients of the model farmer award this year were Ar Promtaisong from Rayong province of Thailand, Phonexay Thammavong from Laos, Fazla Yoosuf from the Maldives and Samson Mahit Haitong from Vanuatu. Uphoff, N. 2007. 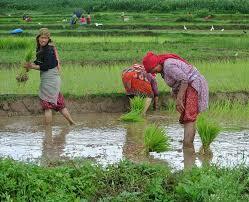 The System of Rice Intensification (SRI) as a System of Agricultural Innovation. Paper presented at the International Workshop: Farmer Participatory Research and Development 20 Years On. Future Agricultures Consortium, Institute of Development Studies, University of Sussex, U.K. 12–14 December 2007 (available at: http://www.future-agricultures.org/farmerfirst/files/T1c_Uphoff.pdf). Author SRI4WomenPosted on November 2, 2018 November 3, 2018 Categories Biodiversity, CA, Climate Change, Food Security, North Korea, SDG1, SDG13, SDG15, SDG2Leave a comment on North Korean SRI Champion wins International Award! A detailed analysis of current farming policies in the context of “Climate Smart Agriculture” and the need for a radical rethink on attitudes to smallholder agriculture and relevant climate change adaptation practices. Any bilateral and multi-lateral climate finance flows should support bottom up, community-driven climate adaptation solutions. Climate funds should not support technologies and approaches that increase the dependence of family and small-scale farmers on costly inputs. The funds should prioritise support projects in line with principles of agroecology and food sovereignty. Climate change mitigation initiatives in the agriculture sector should focus primarily on transforming and phasing-out the industrial agriculture system. National mitigation and adaptation should respect a list of criteria to support transformational change towards agroecology, ensuring food security and sovereignty, restoring ecosystems and biodiversity, as well as defending human rights. Climate change impacts are being felt in many parts of the country, as manifested in erratic rainfall, extreme weather events and changes in cropping patterns. Adapting to these changes at farm and household levels is critical. A new study says women, particularly in marginalised communities, possess necessary knowledge to cope with climate risks. The study assessed the role of individual women in coping with climatic risks, particularly in managing agriculture, energy and nutrition in flood and drought-prone paddy growing region of eastern India. It was found that women’s participation and involvement is much higher in managing nursery as well as in other farm-related functions like transplanting and weeding. Women resort to exchange of knowledge and resources at their level to face exigencies of climatic variation, given the absence of timely governmental interventions. For instance, women use creative ways to manage food and nutrition security in their households in lean months. Many of them plant cucurbits like bottle gourd, pumpkin, satputia (a small cultivar of ridge gourd) and okra in their homesteads, catering to vegetable needs of the family since these are costlier in summer. A few women ensured food security by processing fruits and vegetables and storing them for consumption later. They harvest weeds and segregate them for consumption by human and some for cattle, while non-edible ones are composted. Women in high-risk zones, especially arid and semi-arid zones choose leaves and stem of many plants available throughout the year for food. “This becomes an important coping strategy to fight food shortage or famine. Many of these plants have been used in traditional medicine systems for their therapeutic effects,” the study says. Researchers have documented such weeds used in three villages in the study area. Their expertise and knowledge about non-agricultural food sources help in dealing with food and nutrition availability resulting due to fluctuating climate, the study says. “In a situation when not many technological alternatives are available and climate risks have to be coped with, there are ways in which individual women find creative ways by managing resource exchange and pooling, overcoming class and cultural boundaries,” explained Dr Anil Gupta of Indian Institute of Management Ahmedabad, who conducted the study along with Anamika Dey and Gurdeep Singh of Indian Institute of Technology, Dhanbad. The research is part of a long-term study on loss of agrobiodiversity underway in three villages (Isoulibhari, Shivnathpur, and Kharella) in Faizabad district in eastern Uttar Pradesh. The villages, located in floodplains of the Sarayu river, are flood prone and mostly follow rain-fed rice-wheat cropping system. The region is facing vagaries of climate change. Data of the past 25 years obtained from Narendra Deva University of Agriculture and Technology showed high fluctuation in onset and withdrawal of monsoon, number of rainfall days, total rainfall received and average rainfall received per number of days. “We found that knowledge networks of women contribute immensely to tide over the adverse effect of the risk episodes. But these informal channels of dissemination of the knowledge are often not recorded in formal scientific discourses,” Dr Gupta told India Science Wire. Instead of ignoring the role of such informal networks, they can be used as channels for targeting climate adaptation policies and programmes, the study has suggested. If women groups become focal points of knowledge and resource dissemination in situations like crop failure due to flood or drought, there are fair chances that they will share these more openly. In addition, weather information needs to be provided according to local calendars, which are different from the Gregorian calendars, the study has suggested. The study has been published in journal World Development.